Using a variety of decorations can set the tone for a Mardi Gras party and make the celebration colorful and fun. With themes taken from traditional New Orleans style Mardi Gras parties, the decorations can be dramatic or lighthearted, depending on your own style and budget. 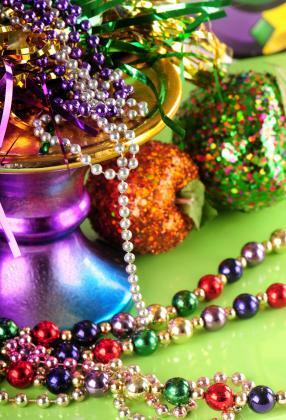 The most commonly known items in Mardi Gras celebrations are the beads. Hang strings of beads like streamers, or place them in small decorative bowls around the room. Hang strands of beads on the walls and let your guests help themselves to the necklaces. You can also decorate outdoors with beads, hang them around the entryway or in trees, and leave bowls of beads on the patio or balcony so guests can throw the beads to party guests as they pass by. Masks are the perfect decoration for a Mardi Gras party and can either be made or purchased. You can design and make your own large masks to decorate the walls or tables, or pick up some inexpensive plain masks and use supplies such as glue glitter, feathers, and other fun craft items to embellish them. Masks can be hung or draped around the room to add a special touch to your party decor. You can find lights designed specifically for Mardi Gras both online or at party supply stores. Keep in mind that even simple strands of multi-colored lights will work well for this purpose. If possible, use lights in colors such as purple, green or gold. Lights can be strung all over the room and inside and outside of your party. Wrap them around trees and porch columns outdoors, and around doorways, windows, and the ceiling inside. Wreaths can be hung on your front door to welcome guests to your party. 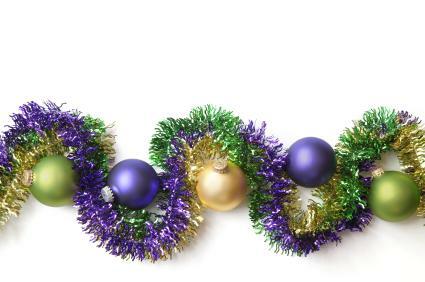 Wreaths for Mardi Gras are often done with mixed balls in colors of purple, green and gold. You can also be creative and make your own wreath using a foam wreath form and wrapping it with purple, green and gold ribbons and using small metallic balls as accents. To add a special touch to your wreath, you can add feathers or a small mask. 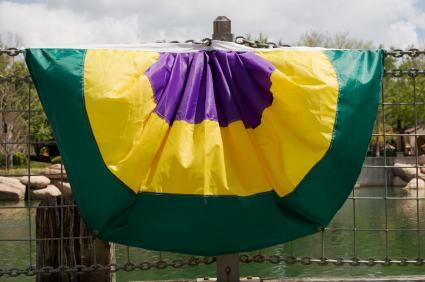 There are a wide variety of Mardi Gras flags that can be used for decoration. From flags done in purple, green and gold to those adorned with a fleur-de-lis or masks, flags can be used to cover or drape walls or hung over a balcony or porch. There are also flags that can be hung on a pole or flag holder. Doubloons are an important part of any Mardi Gras celebration. These colorful coins are often thrown from balconies during Mardi Gras but can serve as a great decoration as well. You can scatter the doubloons on tables and other areas of the room for a colorful accent. Garland can be strung from the ceiling and around the room for an interesting touch. You can find garland in the colors of purple, green and gold, and also garland that is done with Mardi Gras masks, glitter, fringe, and even metallic balls. There are many decorations that can be used on a table. From fun centerpieces and festive confetti, you can be as creative as you like. Beads, coins and gold, green and purple placemats can add to the overall party theme and make your table come to life. No party is complete without colorful balloons. You can get inexpensive helium-filled balloons in green, gold, and purple, and scatter them around your room. You can also blow up balloons and attach them to garland. Balloons are always a fun decorative accent and are enjoyed by guests of all ages. Decorations add a special touch to any party. 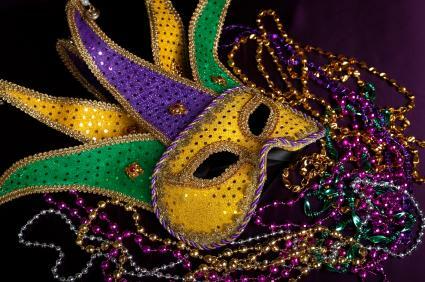 Those used for Mardi Gras can enhance the party's theme and add excitement and interest.